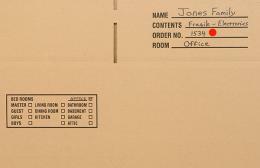 No need to purchase moving labels when they are embedded on all moving boxes- 1 to 3 days delivery for most of the U.S.! Printable moving labels versus having them on the moving box? Professional movers like to use moving labels that are on moving boxes because all of the moving labels are in the same place. For example, the check box of where to put the moving box is placed on the side of the box. The reason for this is when the moving boxes are stacked, your movers need to know where the boxes go without looking on top. If you use printable moving labels, it is easy to put them in places that the movers won't look. Besides, why buy moving labels when they are already included on all of our moving boxes. All moving kits include moving supplies and moving boxes that include embedded moving labels on the moving box. These moving labels are very important because they help you save money on the cost of your move. The reason is by filling out the moving labels on your moving boxes, your movers will be faster because they will know which room to place your boxes in without asking you. Also moving labels help you stay organized in having your boxes be moved in the right room, versus being stacked in your garage. Lastly, moving labels on the moving boxes also helps movers effectively move, as they know what is fragile and how to stack the moving boxes appropriately.